Back in the day when I was fourteen and pretty reckless, my girlfriends and I used to style our hair with clothing irons. 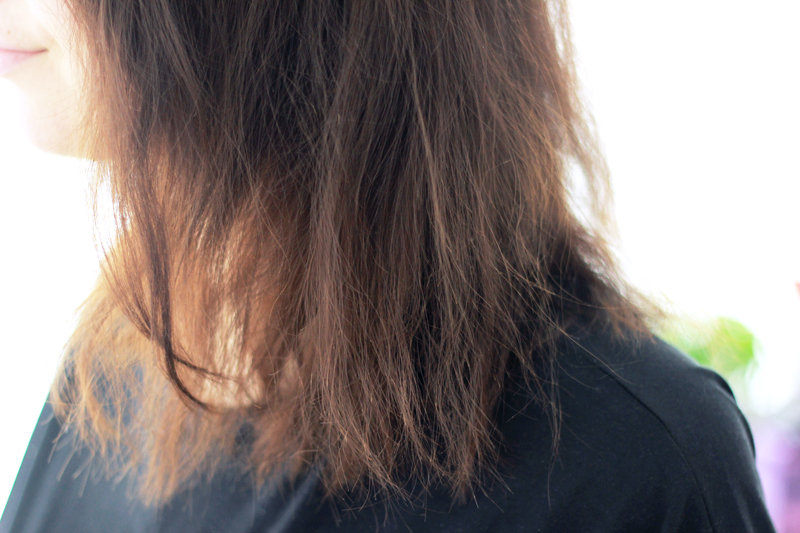 I had never heard of a hair straightener (hey, we're talking 15 years ago!) and I hadn't even ever thought of styling my hair like that, but when one of my BFF's moved back from Australia she told us it was all the hype there. It soon became all the hype pretty much everywhere and I bought my first hair straightener a few years later. From crappy to a little less crappy to my beloved GHD I bought with one of my first full-time pay checks: I went through quite a few. 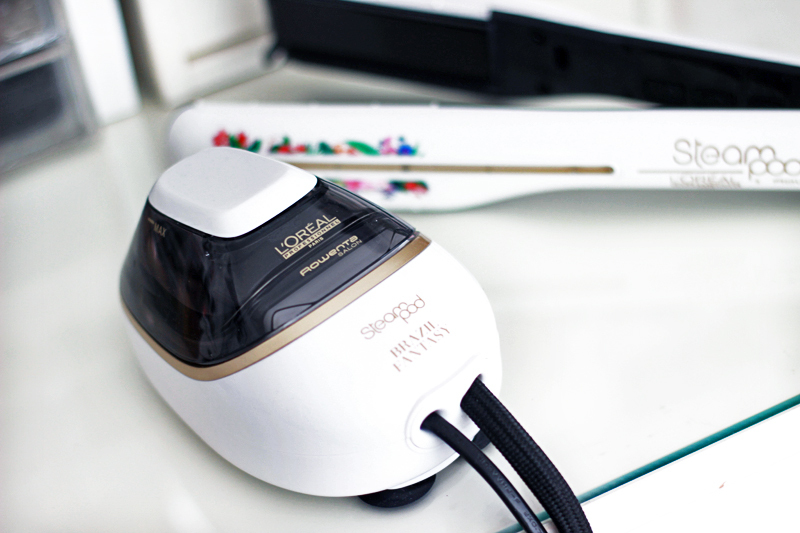 While I hadn't really been thinking about buying a new straightener as my GHD is still in pretty good shape after all those years, I was quite intrigued by the new L'Oréal Professionnel & Rowenta Steampod when it first launched a few years ago. 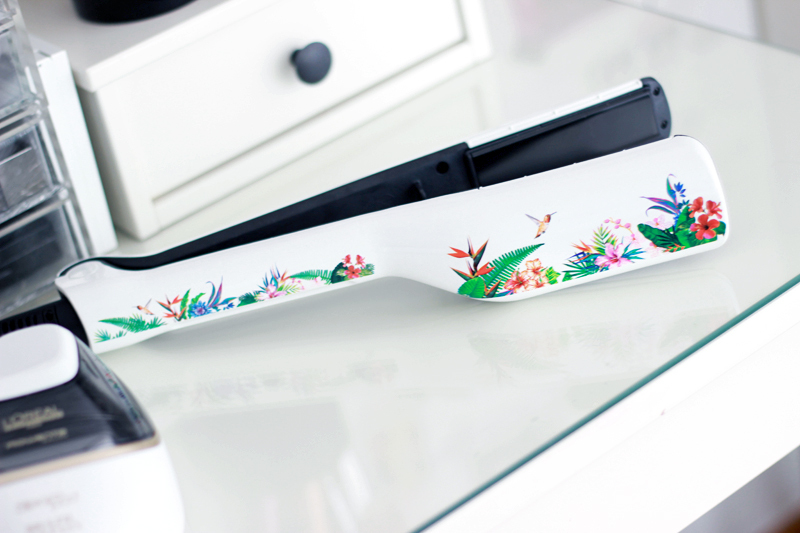 A good new hair styling tool is always quite an investment, so I was pretty happy (and that's an understatement) when the new Steampod - version 2.0 with a pretty limited edition Brazil design - landed on my beauty desk. For those not familiar with the Steampod; it's a hair styling tool that uses steam and pro-keratin technology (when you also use the accompanying products) to straighten your hair and leave it smooth and silky. I was a little sceptic at first, but oh boy.. The results were amazing. With my regular GHD straightener I need to take my time to go through small sections to achieve a very smooth result, and even then it's never 100% super smooth and styled. I have very frizzy natural hair, so it's not easy getting it to look all shiny and bouncy. 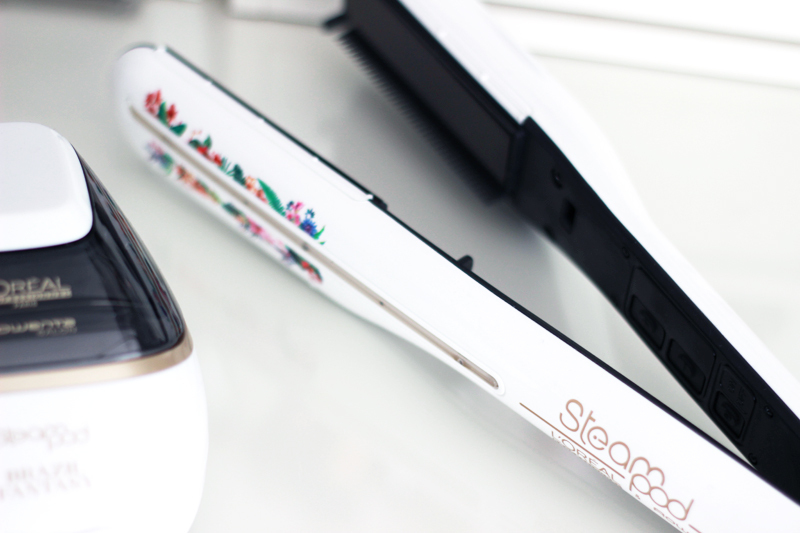 The Steampod makes it very easy: I do all of my hair in less than 5 minutes with the heat setting at 180°C (it goes from 140°C to 210°C). The comb next to the plates makes sure all hair is straightened evenly & the steam transforms all frizz to a silky 'do. I was happy to find that all those rave reviews are true: the results are ah-mazing. It is quite a bulky tool so it's not ideal for traveling, but for short travels for work I've been taking it with me anyway. I wash my hair every two days & definitely don't need to style my hair again on the second day. The sleek 'do really lasts! I do find that my hair turns oily a little sooner than when I don't use steam to style it, but it's only a matter of a few hours difference. There is a special branded Steampod line of styling products which contain steam activated pro-keratin, but I also like using the L'Oréal Mythic Oil leave-in heat protecting conditioner (Sève Thermique) which also gives great results in combination with this styling technique. L'Oréal and Rowenta also claim that this special steam straightening tool causes less heat damage, but I can't really comment on that as my hair is quite fragile anyhow and I didn't particularly notice any less damage since I used the Steampod. It does look much healthier because of the sleek style & the texture is much smoother and so silky. The verdict: I am in love with this styling tool! Whenever I want my hair to be sleek & straight I turn to this one, using my GHD straighteners only when I want curls (ironically..). 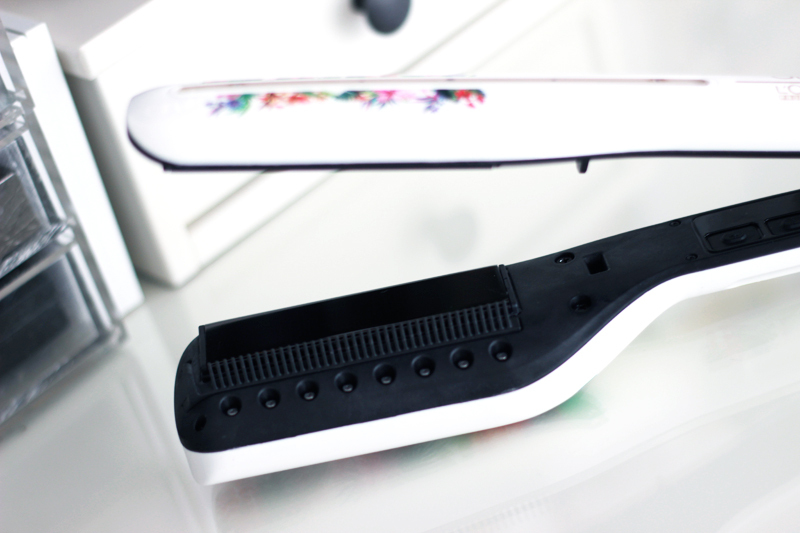 It is quite the investment, but if you've been looking into getting a good professional straightening tool you'll find that hair straighteners from brands like Chi and GHD are also quite pricey. 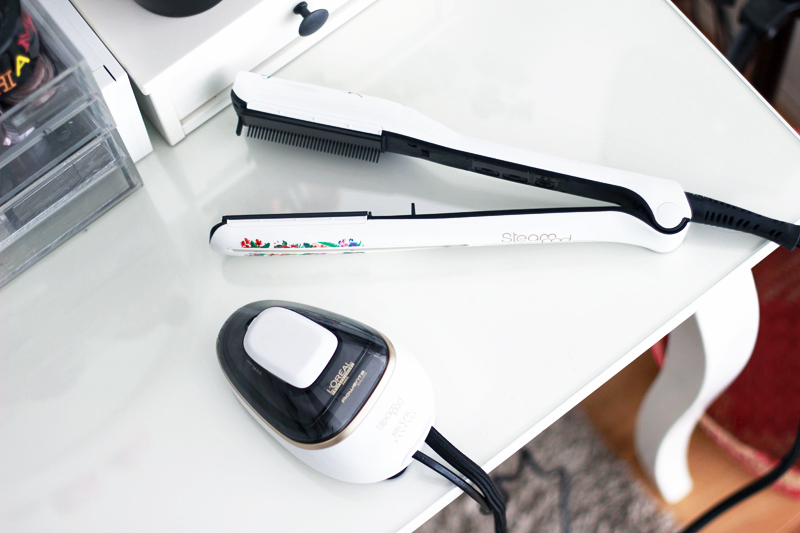 You only need to consider that making curls isn't very easy with the Steampod (it should be easier on long hair though, as you see in this review), so this is the perfect tool for anyone who loves wearing their hair sleek and straight. I also use this tool before making soft waves - the effect is very Hollywood-esque! 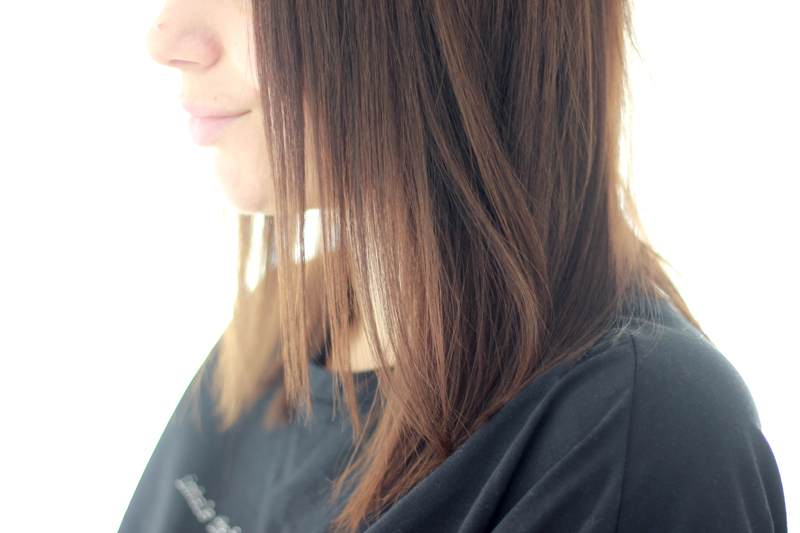 PS: my hair colour has faded a little & looks so light and red in the sunlight! I'm not sure whether I like it or not, I've been doubting to go a little darker than usual for next hair dye. What do you think?